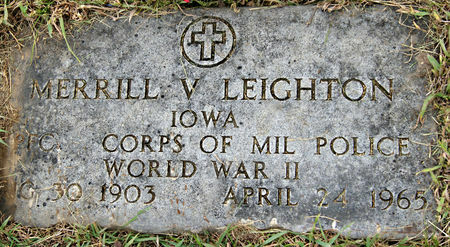 Merrill Vernon Leighton, son of Alba Jacob Leighton and Estella Blanche Osborne, was born Aug. 30, 1903 in Page Co., Iowa and died April 24, 1965 in Omaha, Douglas Co., Nebraska. He married Nellie Edna Fitzgerald Warner April 2, 1944 at Lenox, Taylor Co., Iowa. Searching for MERRILL VERNON LEIGHTON in Taylor County Iowa?